Robin Hall was born in Edinburgh in 1936. As a child the family moved to Glasgow and he attended Allan Glen's School. His first career choice was acting and he went to the Royal Scottish Academy of Music and Drama. He tried his luck in London but fell back on making music to live. When he appeared at a youth music festival in Vienna in 1959 he was partnered by Jimmy McGregor on stage. Although strangers off stage their harmony was so good it attracted praise from the legendary Paul Robeson, who was also appearing at the same concert. The pair decided to team up and their big break came when back in London their agent convinced the BBC’s current affairs program “Tonight “to feature them on Burns Night. Neither Hall nor MacGregor knew any of the Bard’s work but legendarily rehearsed “Rantin’ Rovin’ Robin “in the taxi on the way to the studio. So popular did they prove the duo was given a ten-year residency. Jimmie McGregor was born in 1930 in Springburn, Glasgow. He was a real tenement kid and grew up in a musical family. After his national service, he studied ceramics at the Glasgow School of Art. He loved playing his guitar and sang in local folk clubs. During this time, he became friendly with Annie Wilson (Nancy Whiskey) a fellow student and folk singer. He tried teaching but the call to perform was greater and moved to London. Jimmy liked blues music and was taken with the new skiffle craze. He joined the Chas McDevitt skiffle group where he once again met up with Nancy Whiskey. Eager to play more authentic music he left the band and played with the Steve Benbow Folk Four before joining The City Ramblers. 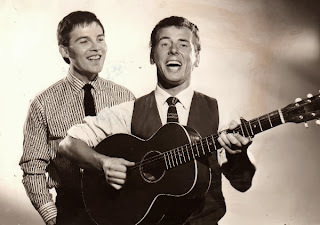 Whilst the duo, Robin Hall and Jimmy McGregor appeared on the BBC (i.e. Tonight programme and the White Heather Club) they both played and recorded in The Galliards with Leon Rosselson (banjo and guitar) and Shirley Bland (vocals). Their repertoire consisted of folk songs from the British Isles and from around the world. The group broke up in 1963. Hall and Macgregor recorded over 20 albums during their partnership, which ended in 1981. They were Scotland’s first folk stars and became household names throughout the UK. Following the split both successfully continued in broadcasting. Robin Hall died in 1998, aged 62.